Wrinkles are no more just signs of aging; they are also signs of pollution, signs of our daily routine, signs of our stress levels, signs of our bad habits, signs of chemicals present in our ecosystem and many other similar factors. Hundreds of products are commercially available in the market that promise to take that wrinkle away from your skin, but are they really affective? Are they value for the amount of money you spend on them each month? Are they removing the wrinkles or just lightening them and causing newer wrinkles? Are they having any side effects on your skin in the longer run? The best way, even today, to tackle wrinkles on your skin is to mask your face with a homemade mask. This mask can be easily homemade by using various ingredients put together to make the mask that best suits your skin requirements and helps you tackle your wrinkles without having any side effects, either to your skin or to your pocket! 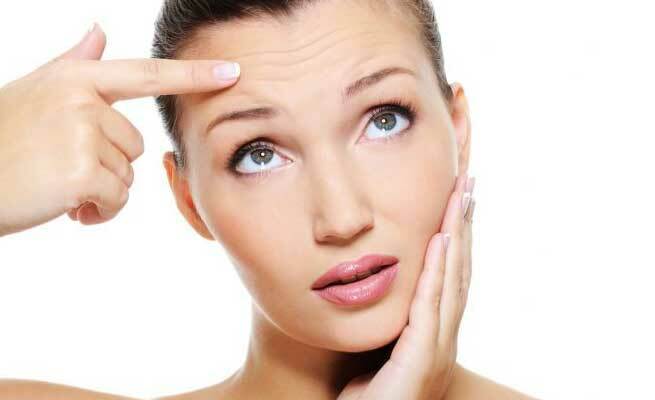 Here is a list of 10 extremely easy masks that you can make and use to get wrinkle free skin. 1. Egg white anti ageing mask for wrinkles – This is one of the easiest and quickest homemade masks. A lot of variants are possible. Simplest is to just apply the egg white on a clean skin and let it dry off for 15-20 minutes, rinse and see the difference. 2. Egg white with Honey & Tea tree oil anti ageing mask for wrinkles – Just mix a spoon of Honey and 4-5 drops of Tea tree oil and you have an excellent mask for wrinkle free skin that also helps to reduce Acne and provides moisture to your skin. 3. Banana anti ageing mask for wrinkles – Banana boosts collagen production and is one of the most beneficial skin treatment fruits. To make a banana anti wrinkle face mask, take a ripe banana, 4 tablespoons of curd and 2 spoons of honey. Mix them together and mince all of them to make a uniform paste. Warm this paste in a pan for few minutes and then apply it as a mask for 15 minutes before washing it off with warm water. 4. Buttermilk, Oatmeal & Oil anti ageing mask for wrinkles – Mix half a cup of buttermilk with 2 spoons of oatmeal, warm it for few minutes till the oatmeal softens. Mix 2 spoons of almond oil and olive oil in this mixture and allow it to cool down. Apply the mixture over your skin and leave it to dry off for 20 minutes. Wash with cold water and pat dry your skin. 5. Curd and Lemon anti ageing mask for wrinkles – Curd has Lactic acid that is a natural skin cleanser. Mix half a cup of curd with lemon juice and 4 spoons of Olive oil. Make a paste out of them by mixing them. Apply the paste on your skin and leave it to dry off for 20 minutes. Remove the mask with rose water by using a sponge or a cotton ball. Do not use water for one hour so that skin is nourished. 6. Curd and Turmeric face mask – Take half a cup of curd and mix 2 spoons of turmeric powder to it. Mix them together into a paste, apply the paste on your face and let it dry for 15 minutes. Wash the mask off with cold water. 7. Lentil or Masoor dal face pack – Take half a cup of grinded masoor dal and mix it with luke warm water. Make a paste and apply the paste as a mask on your face and neck area. Let it dry for 25 minutes and then scrub it well over your skin while removing it with cold water. 8. Apple face mask for wrinkle – Take one apple and boil it completely in water. Let it cool off, remove its seeds and mash it properly into a uniform paste. Add one spoon of honey and milk powder to it. Apply this paste as a mask on your face and leave it on for 15 minutes. Rinse it off with cool water. 9. Olive oil and Lemon juice face pack – Mix equal portions of Olive oil and Lemon juice in a bowl, warm it for few minutes and apply it as a mask on your face. Let it dry for 15 minutes and rinse it off with cold water. 10. Lime juice and Milk cream face pack – Mix half a cup of milk cream with 4 spoons of lime juice. Apply it as a mask on your face evenly. Let it dry and wash it with cold water and tone then moisturise your face afterwards. There is no stopping you to try one of these or all of these on your skin on a regular basis to fight wrinkles and ageing signs. The best things about these masks are that they do not have any side effects and all the ingredients are available with you in your home. Go on and discover your very own home made anti ageing mask to fight wrinkles.